This beautifully furnished upstairs unit of the duplex offers nearly 1400 square feet of luxury living space. 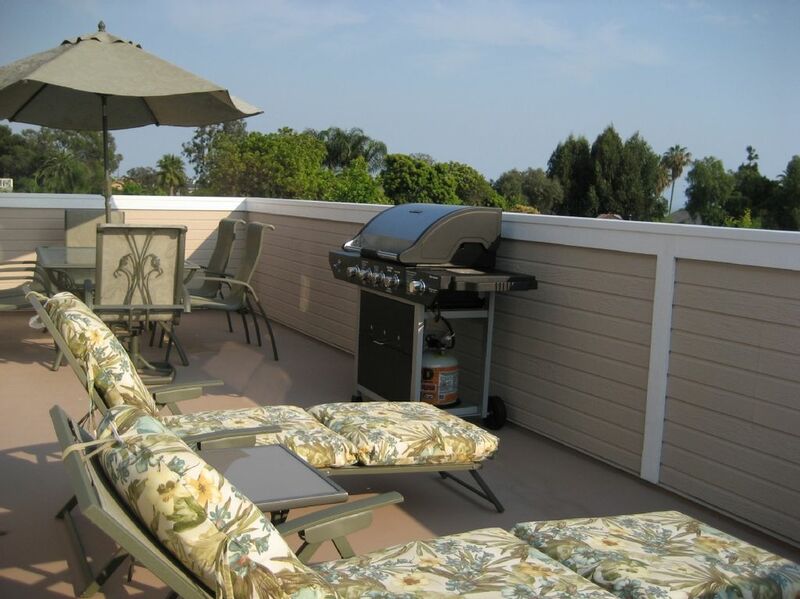 The spacious balcony is great for sunbathing and BBQs. A 10 minute stroll takes you to Capistrano Beach and Doheny State Beach for fun in the sand and water. If sand isn't your thing, stay on top of the bluffs at nearby Pines Park and Palisades Gazebo Park for a 180 degree view of Southern California's magnificent coastline. Damages: I, Renter, understand my responsibility as occupant and accept financial burden for any damages to this duplex caused by me or any member of my party. By completing this reservation, I agree to pay the owners for repairs in the event damages are caused by us during our stay, and I agree to pay replacement value for any items which are broken or lost to theft during my stay. Such damages will be reported to the owners as soon as is practical. Liability: I, Renter, agree that the owner is not responsible for any property loss, property damage, or personal injury that occurs to myself or to any member of my party at anytime during our visit. Smoking and Pets: I, Renter, agree not to smoke and not to bring any pets into this duplex. Noise: I, Renter, agree to keep the noise to a minimum after 10pm. The neighbors will not tolerate the noise and call the police. Cancellation: I, Renter, have read and agree to the cancellation policy for this duplex. Refunds: Cancellations made inside of 30 days will result in the forfeiture of all funds unless a replacement booking (another renter books the entire period that is to be canceled) can be made. Deposits: 50% of total (including tax, cleaning, and security deposit) due at time of reservation with the remaining balance to be paid 30 days prior to arrival. Any unused portion of the security deposit will be returned within 14 days after departure. All-in-one game table consists of pool, foosball, ping pong. Blu-ray player with FREE Netflix streaming. Telephone - FREE US calls. all us girls enjoyed staying at your house. Very roomy and comfortable. The only thing was the dogs next door barking in the morning. Clean, spacious Condo in nice neighborhood. The condo was very spacious! The bed in the master was very comfortable. Plenty of towels and extra bedding. Great supply of cooking and kitchen utensils. Located in a nice quiet neighborhood. The balcony was perfect to sit and enjoy the warmth of the sun. Great airflow while windows were open. The fireplace was enjoyable for the evening chill! Thank you for a wonderful week! The property was spacious and comfortable. It's near the beach and restaurants. This property was amazing! Everything we could ever need for a family of 5. Extremely comfortable beds & pull out. Upper outside deck was the best! We enjoyed morning breakfasts & nightly cocktails on it. Very clean & spacious too. We will absolutely be back to stay at this property & highly recommend it to anyone!! It was an excellent place and my family and I, we really enjoyed it. It is very nice vacation place and very close to the beach in a quiet residential area. The location is perfect if you think about a middle location to commute North (Anaheim and Los Angeles) and South (San Diego). Staying at this place makes you feel like home really. The hosts were very helpful and very welcoming. Great House, Great Location...close to everything! We stayed here July 2016 for our summer vacation; family of 4. The house was perfectly located to the beach, grocery stores, park, restaurants, freeways etc. It was a great space for our family of 4. We enjoyed our nights on the balcony having family dinners! We opened all the windows during the mornings and days; enjoyed the beautiful breeze and weather. Evenings were the only time we turned on the AC units; we are from AZ so we like to sleep cool. Each morning and evening we either walked to Pines Park, the gazebo overlook of the ocean or to the beach. The walk did have a nice hill to and from the beach but if you are looking for a good workout you got it. We were so close to grocery stores we did most of our meals at the house. Doheny Beach park was the closest and it was perfect for our two 7 year old boys. The waves were great and we could park so close the beach we did not have to carry our stuff along ways. Beautiful walking paths all throughout Dana Point as well. The house had plenty of towels etc; setup was perfect. I also loved there was not a HUGE of requirements for check-in and check-out procedures. We have rented other VRBO's and some of the places go overboard with all the cleaning you had to to etc before you left etc. We have been pack now 5 days from our trip and we already received our security deposit back. Linda was so easy to work with on getting the place secured for our stay. We would stay at this residence again in a heartbeat. Beautiful area and very comfortable home. Thank you for a great summer vacation. This Capistrano Beach home is centrally located to all the major attractions in Southern California. Locally historic Mission San Juan Capistrano / Dana Point Harbor. 20 miles - Shopping - Newport Beach's Fashion Island / South Coast Plaza. Coastal Drive - Laguna Beach / Newport Beach / Huntington Beach / Queen Mary. 1.5 hour boat trip to Catalina Island from Dana Point. 30 miles North - Anaheim:Disneyland / California Adventure / Knott's Berry Farm / catch a sporting event at Angels Stadium and Arrowhead Pond. 50 miles North - Hollywood:Universal Studios / Kodak Theater / see the stars on the famous 'Hollywood Walk of Fame' in front of Grauman's Chinese Theater. 30 miles South - Carlsbad: Legoland. 50 miles South - San Diego: Sea World / San Diego Zoo / Wild Animal Park / Balboa Park.